Nicholas G. Werkman III was born July 17, 1942 in Trenton. He had three siblings—sister Marianne and twin brothers Mark and Phil. There was always lots of activity in the Werkman home, with an emphasis on athletics. Nick was tall, athletic, double-jointed and ambidextrous with a basketball. He had moves around the basket that no one had ever seen before—mixed in with the cockiness of a deadly scorer. Nicknamed “Nick the Quick,” he was an expert at maneuvering his rangy 6’3” frame into open looks at the basket, and could score from almost anywhere on the court. That ability was the result of a legendary practice ethic. Nick famously shot at the local playground by moonlight. Nick was the star of the Immaculate Conception Grammar School team in the mid-1950s, and in 1956 led the school to an immaculate 33–0 record. Nick later played forward for Trenton Catholic High School. He scored 30 or more points regularly for the Golden Waves. There was nothing fancy about his game—he would find a way to get open for a pass, and then attack the basket and draw contact. He was so agile that defenders would have to hug him to keep him from scoring, and sometimes not even that worked. On many nights as a high-schooler and collegian, half of his points came on free throws. The Golden Waves won three conference championships with Nick leading the way and were the New Jersey Parochial Catholic champs in 1960. He was named MVP of several tournaments and exhibition games, including the NY/NJ All-Star Game, and was named the state’s High School Athlete of the Year in 1960. 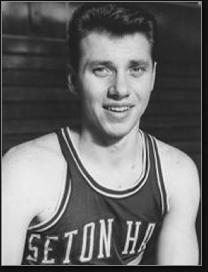 Nick graduated in 1960 and accepted a basketball scholarship from Seton Hall, where he was a pre-med student. He was the best player on campus in 1960–61, but freshmen were ineligible at that time, so he worked out with the varsity but played for the Pirates’ freshman team. Following Nick’s freshman year, a point-shaving scandal engulfed college basketball. Seton Hall varsity members Art Hicks and Hank Gunther were implicated and the Pirates were banned from postseason play for three years. Bishop John Dougherty, the school’s president, considered shutting down the program entirely. Technically, Nick could have left Seton Hall without losing a year of eligibility, but he and his remaining teammates felt it was their duty to restore the program. Nick had a legendary season as a sophomore, averaging 33.0 points per game to finish third in the nation behind Billy McGill and Jack Foley. At the time, his was the eighth-highest season average in college history. Nick won the NCAA scoring championship as a junior in 1962–63 with a 29.5 average. In the final game of the season, he held a slim lead over Barry Kramer of NYU for the title. Kramer needed 31 points to overtake him and fell short by three in NYU’s game against the UNC Tar Heels, making Nick Seton Hall’s one and only NCAA scoring champion. He was so happy when he heard the news, he jumped in the air and accidentally punched a hole in the ceiling. 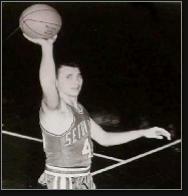 Nick upped his average to 33.2 points per game as a senior in 1963–64, but was edged by Howie Komives of Bowling Green for a second scoring title. The Pirates finished a disappointing 14–12 that year. However, Nick earned All-America recognition for the second year in a row. He was also named Metropolitan Player of the Year in 1964. The school’s record during Nick’s three varsity seasons was 42–28. His career mark of 2,273 points is still a record for Seton Hall, even after freshmen became eligible for varsity ball and the 3-point shot came into being. Nick led the Pirates in rebounding all three varsity seasons, and ranked 13th in the nation in that category with 17.0 a game as a sophomore. His 32.0 career scoring average is still one of the Top 10 in Division I history. Nick also averaged 14.6 rebounds per game—quite an accomplishment for a player of his size. Nick was drafted in the fifth round by the Boston Celtics in 1964, but that’s where his playing career would end. There was no room on the Celtics for a 6’3 190-pound forward, nor in the NBA for that matter. Nick might have found a home in the ABA in 1967 but by then he had already begun his post-graduate career. He later earned a Masters degree from Seton Hall. Eventually, Nick made his home in Toms River. His son, Nick IV, became a star for the Toms River East baseball team in the 1980s. Nick enjoyed a resurgence in recognition and popularity in 1989, when the Pirates made it to the Final Four. Like many of his teammates in the 1960s, he felt that he’d been rewarded for his hard work and loyalty in saving Seton Hall basketball from extinction.